St. John the Evangelist Catholic School is a K3-8 school in Pensacola, Florida with 144 years of tradition and excellence. St. John Catholic School offers a safe and supportive educational environment where students receive a strong foundation in faith, service, and life-long learning. Please take a moment and look at everything St. John Catholic School has to offer. Happy Easter! St. John School will be closed for Spring Break until Monday, April 29th. It's never too early to register for the 36th annual St. John Sunset Run. This year promises to be bigger and better...With an amazing race along the shore line of Bayou Grande, awesome authentic Hispanic food that will leave you wanting MORE, and a fantastic concert with our own Fr. John live and on stage, YOU CAN'T GO WRONG! Register on RunSignUp.com for the 5k run, walk, or one mile fun run on Sat., May 11th. Please support this fundraiser for our school by sending in the donation listed below by grade level. Donations may be taken to the cafeteria stage any morning or afternoon prior to the race on May 11th. THANK YOU! Each year we ​travel from classroom to classroom journeying through important parts of the life of Christ. It's a beautiful way to begin celebrating the Triduum -- the three holiest days of our church year! 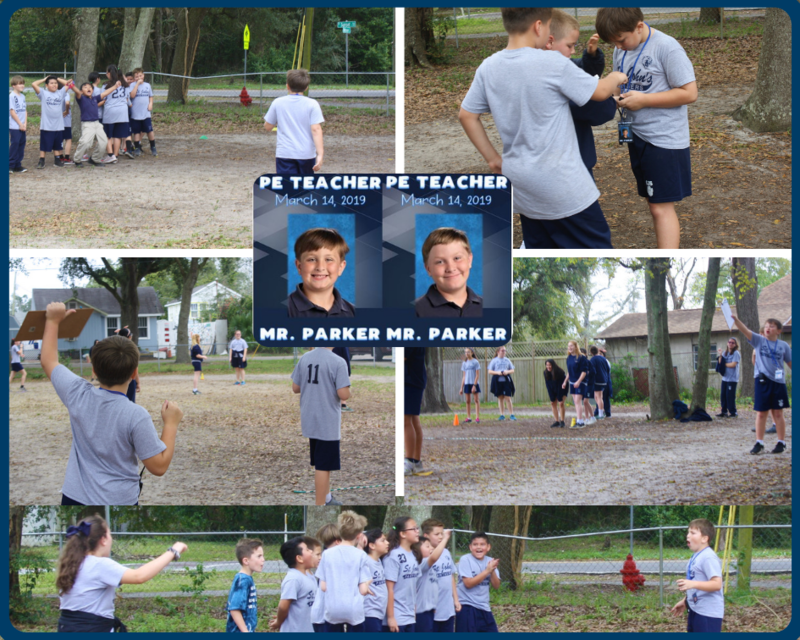 The Parker boys won the role of PE Coach for the Day at the St. John School Gala! Happy Panther Pride Day from St. John School! Students were greeted by our very on friendly panther and the message that "SJS Panthers are Loved" on Friday morning! Get past, present and future St. John School news delivered right to your inbox. The Diocese of Pensacola-Tallahassee is committed to healing the hurting hearts of sexual abuse victims. It has established Victims Assistance Coordinators, experienced and trained counselors, who are available to help persons who have been sexually abused by a priest, deacon, or other church personnel.The Coordinator for the Pensacola/Fort Walton area is Louis M. Makarowski Ph.D., P.A. He may be reached at (850) 477-7181. St. John the Evangelist, as a Catholic school, provides a safe, caring, Christ-centered environment. We guide our students in developing academic excellence, leadership skills, and personal responsibility through the use of religion, reason, and loving kindness. Based on our Catholic faith, we are a community working for respect of all, service to others, and social justice in our world.